Diwali 2017 – Samvat 2073 was a good year for the stock market investors. Demonetization, GST Implementation, Favorable government policy on entrepreneurship and Aadhaar enablement were major events this year. The BSE Sensex has gained 14% in samvat 2073 from Diwali to this year till October 10. This year, Diwali falls on 19th October 2017 (Thursday). Muhurat Trading session will be held on the same day between 6:30 PM to 7:30 PM. Muhurat Trading is an auspicious time to buy stocks for the investment. If you are planning to buy stocks on Muhurat trading I have something interesting for you. I am here with 15 Best stocks to buy in Muhurat trading. These stocks are recommended by leading brokerage house Axis Direct and ICICI securities. The first diwali stock by Axis Direct is APL Apollo. APL Apollo Tubes is the largest manufacturer of ERW pipes in India with the wide distribution network. APL Apollo Tube is a key beneficiary of Infrastructure growth. The target price for APL Apollo Tubes is Rs.2195. Dilip Buildcon is one of the largest and fastest growing road focused engineering construction contractor in India. This year Dilip Buildcon is planning to sale BOT assets. This will help the company to reduce debt level and improve balance sheet. Target price set for Dilip the Buildcon set by Axis Direct is Rs.867. Jagran Prakashan is a media company. Next year due to election political party is expected to increase media spend. This will give benefit to Jagran Prakashan. Additionally, expansion in radio sector will be another growth trigger for this stock. Axis direct recommends this stock with target price of Rs.205. Lumax Industries is next stock recommended by Axis Direct. The research report says that Lumax Industries is a big beneficiary of increasing LED usage in 2 wheeler and 4 wheeler segment. The new regulation of increasing LED usage in automobile gives multifold benefit to this stock. Target set for this stock is Rs.1597. Maruti Suzuki is a market leader with 51% share in the Indian personal vehicle space. A strong product portfolio, distribution network, new models and increase in revenue is plus point for this stock. The target price set for this stock by Axis direct is Rs.9298. Minda corporation is a diversified auto-ancillary company with product portfolio starting from safety security and resistant system to driver information and Telematics system. The company is geared up for upcoming disruptions. The turnaround in JVs, focus on exports and greenfield expansion will boost volume and profit of the company. Target price of Minda Corporation is Rs.183. Mod-Teck packaging is from packaging industry. Mod-Teck enjoys strong customer base from food and FMCG segment. Advancement in technology like using robots and new products in the pipeline will give additional benefit to this stock. Axis direct recommend this stock with target price of Rs.356. Reliance industries is another stock recommended by Axis direct. A new Jio Phone launch will bring very good growth to this company. In addition to that company is expected to commission new RoGC and Pet coke gasification project. This will boost PAT of a company. Target price set for this stock is Rs. 987. 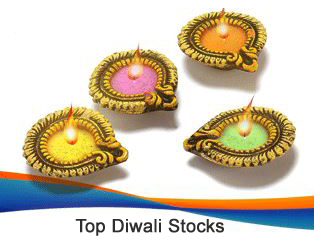 For more information refer to Diwali Muhurat Stock Picks Research Report by Axis Direct. HDFC is first stock recommended by ICICI Securities this Diwali. HDFC has a very good track record in terms of earning. Increase in loan demand and valuation is plus point for this stock. It is recommended to invest in this stock with target price of Rs.2056. Sagar Cement is one of the leading cement company. ICICI brokerage firm expects revenue of this company will grow substantially. The stock is trading at an attractive valuation. The stock is recommended for investment with the target price of Rs.1025. Ineos Styrolution is very good company dealing in styrenics applications. The company has a rich and unique product line. A Company has a strategy to strengthen its position in industries. This will lead to steady volume and profit growth. Target price of this stock is Rs.1250. NRB is largest needle and cylindrical roller bearings producer. As per brokerage house, NRB Bearing is available at reasonable valuations. The growth outlook of the company is very good. You can invest in a stock with target price of Rs.160. Mayur Uniquoters is a manufacturer of rexine, PVC coated fiber and leather. Historically Mayur Uniquoters has given very good performance. A strong customer base and increase in demand are plus points for this stock. ICICI securities recommend this stock with target price of Rs.450. MM Forging is another recommended Diwali stock by ICICI securities. MM Forging has a stable track record of finance. The rating of stock seems to be attractive. As per ICICI securities one can invest in a stock with target price of Rs.1020. Do you think above stocks are the best stocks to buy on muhurat trading ? May this auspicious festival bring you Crackers of Joy, Chants of Bliss, Light of Success & Color of Prosperity. Note – The stocks recommendations given in section above are of various brokerage houses and do not represent those of Moneyexcel.com. Please consult your financial advisor before taking any position in above stocks.